Harvest Ale | Goose Island Beer Co. Pours a dark coppery amber with a very light tan head. The hops are definitely apparent from the smell of this one. It is a thick-medium body and seemingly lightly carbonated. The taste is delicious! Very crisp and hoppy with a solid hop aftertaste but not really bitter at all--more of a sweet-hop that lingers. This one I will definitely buy again and recommend to others without a doubt! 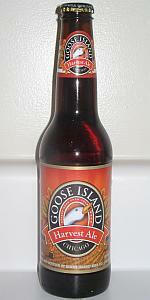 Brewed and bottled by Goose Island Beer Co. in Baldwinsville, NY??? Okay, I guess they are doing some contract brewing in Baldwinsville, NY or AB is brewing at one of their locations to increase production. Regardless the beer in this bottle is good so far, here's some more details. Beautiful copper bronze body forms thick with a light tan head slightly off white head, fine speckled layered lacing forms on the sides of my nonic pint glass. Aroma has citric, herbal/earthy notes that smell great, along with a crisp malt heavy backbone, giving perfect balance to my first few sniffs. Striking fresh hop flavor flows freely through with each sip leaving a nice smooth level of bitterness on each palate starts citric earthy finishes with a bit of spice/mint combo held together with amber roasted specialty grains. Under 8 bucks a sixer and readily available now due to the AB distribution network. I was nervous to try this seasonal because the 12 packs brewed in NY were not matching up this summer, this however shows promise for future endeavors and specialty releases not brewed in Chicago. The Oktoberfest I get in Ohio says brewed and bottled in Chicago, IL it's stellar this year, I haven't had one brewed in Baldwinsville, NY to compare. Mouthfeel is dead on smooth even carbonation slightly slick hop oils glide across the palate, this pairs well with pizza, meat and cheese trays, steaks, and just about anything a very versatile well brewed Harvest Ale (ESB) that should be sessioned and enjoyed by all. Price point is right, quality is on par it's going to be a great stand by this fall season. Appearance: The body has a rich hazy amber color with some nice visible carbonation and a light beige head on top. This head is about two fingers tall at the end of the pour and fades slowly making some nice lace patterns on the way down the glass. Smell: The aroma has some herbal/earthy/leafy hops up first with some mellow fruity/estery and light caramel like malty sweetness in the background. Taste/Palate: The flavor reflects this with a great balance or mix of bready, yeasty and fruity (apricot/peach notes) maltiness with herbal and slightly citrusy floral hops. Its medium bodied and smoothly textured with a well blended mild finish. Notes: The subtle complexity and great drinkability make for a fun rounded drinking session. Pours amber with a reddish hue. Head shrinks to a light khaki surface covering. Caramel aroma with piney hops, toasted nuts, and malt with overall hints of sweetness throughout. Mouthfeel is medium, yet slight thinner. Carbonation stays mostly along the middle of the tongue. Flavor has a biscuity front with a sweet malt, caramel and grain. Piney hop bitterness emerges in the middle. Finish merges the hop bitterness with a nuttiness that's really satisfying. This is a nice hearty fall beer. Perfect for pairing with some heartier fare like stews or roasted meats. It would go well with sandwiches on artisinal bread. I'd have to say that this was one of the more enjoyable new offerings from G.I. in the past few years. A-Crystal clear copper with a nice head not alot of retention but good lace. S-It actually reminds me of walking outside in the fall, very earthy/Leafy notes of hops and barley also some spicy grain notes. T-Very subtle yet very good. Spicy with grain flavor with some maltyness and a nice warming finish. Note some bitter hops in the middle. M-Light body great carbonation level nice and smooth. D-I will enojy this one more before fall lets out and with the suprising warming sensation may save a few for winter. Clear, dark amber hue, big, frothy, creamy head....looks nice. Drinking it, now...tangible hop profile, good bitterness on the tongue, but not too much, just enough to make an impression and stay there. Malt is king, though, too... a fresh, lively ESB. Good for that. 12 oz brown longneck with clear freshness dating. Poured into a pint glass, the beer is a reddish brown with a large, dense off-white head. Nice aroma of pine, caramel and something earthy. Nice smelling beer here! The taste is nicely bitter, but is balanced by a substantial malt backbone. There are some pine notes, backed by biscuits, caramel & apple. That earthy taste emerges late and adds a nice finishing touch. The mouth is chalky and beefy. This is great session beer. It drinks easy, but has plenty going on to hold your attention. While I will miss the Goose O-Fest, this will help ease the pain. Well done!! LOOK: Pours a copper with a white soapy head and laces the glass well. SMELL: Has a nice citrus hop smell, with caramel malts beneath. Hoppy scent that reminds one of a fresh bag of hops. TASTE: In the flavor, earthy, piney hops are upfront with notes of citrus. The bitterness stands up well to a sturdy malt foundation. Has a slight herbal grassiness and hints at lemongrass at times. FEEL: On the light side of Medium bodied, well carbonated, a bit thin. OVERALL: An average to good harvest ale that provides enough hop flavor to keep things interesting. Bottled on 8-6-12. Poured into a tall pilsner glass. A- Pours a mostly translucent medium amber hue. Lots of red hues with a sizable off-white head. Head is pretty large, but I poured it a little violently. Great retention and good lacing. S- Complex mix of malts and hops. Definite hop 'bite' smell, not quite floral, but more on the pine scent side. Very little sweetness is detectable in the scent. T- Starts with a moderate does of hops bitterness mixed in with a some mild malts. The malts kick in after that in an amplified way. Very malty, with definite caramel and medium grainy flavors. Hops fade away as you drink, and the malt ends it. Not a sweeter malt flavor, but a middle of the road, bready flavor malt. M- This one was a little thin. Low levels of carbonation despite the big head and effervescence. Light in body for how malty it is. Overall, a little disappointed. Maybe if I had it fresher the hops would be more prominent. Not a terrible beer, but a let down and not really my style. Lightly dullish pumpkin amber hue with a beige crown of firm, creamy foam that sits at a good medium height, no more no less. A drifted skim is left behind and keeps well once the crown dwindles down. Moderate lacing in some broken sheeting that lends some connect the dotted strings. Nice clean and fairly bold nose with some buzzing dull pine sided citrusy hops and a load of caramel with a dusting of cardboard-like wood notes. Taste is ample with a simple display of dull apple, cedar wood chips, lightly toasted toffee, and some leafy hops puffing about in the finish with just a pinching squeeze of dryish orange oiled bitterness mixed with more woody notes. Nice malt carraige underneath always pulling in a light bready, caramel/toffee tinted sweetness to balance it out. Dead on light/medium body with a clean profile overall. Nice smooth grab of carbonation and subtle hops tones thoughout. Malt base seems to keep it just bready sweet enough. Allowing for a nice ESB balance of the hops into play. A very solid ESB. Quite quenchable and for the style is just Americanized enough by GI to make it worth drinking more then two or so. Sure, its usually a fairly boring style, but sometimes the basics are well worth establishing. 12oz bottle into my Terrapin glass. It poured dark amber in color with a thin white head barely covering the top of the beer. The aroma has some toasted, slightly grainy and sweet malts coming through. I also get some zesty citrus to it as well. Nice mix of hoppy and malty, and a pretty appealing aroma overall. The taste starts out with more of the malty, sweeter, caramel flavors to it. Midway I start to get more of the toasty malts mixing in with some zesty citrus. A little resiny bitterness helps balance it out in the finish. The mouthfeel is medium bodied with carbonation being moderate. Overall it was a pretty decent beer. It was easy drinking and flavorful and a pretty nice beer overall. Harvest Ale from Goose Island Beer Co.